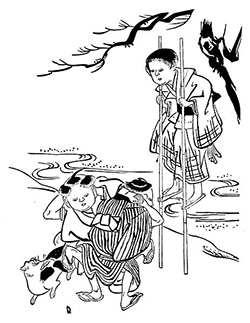 Illustration from Child Life in Japan. Artist unknown. Matilda Chaplin Ayrton, author of Child-Life in Japan, was one of the first women to be enrolled at modern British university, and attended university to be a doctor. She was passionate about women’s issues including suffrage, and wrote about extensively about medical issues. After moving to Japan for her husband’s new job, she became immersed in the Japanese culture, even starting a school for Japanese midwives. After falling in love with Japan, she wrote A Child-Life in Japan. The book featured seven full-page pictures by Japanese artists, and was translated by William Elliot Griffis, who also writes an introduction for the the edition published by D.C Heath and Company in 1901. Ayrton provides a glimpse of different aspects of child life in nineteenth century Japan interwoven with some popular tales.